A phone from BlackBerry, software updates from Apple, a monster processor chip from Intel and a brand new laptop from Asus... it's all here in our daily digest of the five most important stories in tech happening right now, courtesy of our friends at TechRadar. 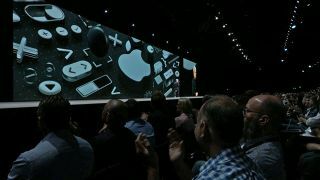 We're still digesting all the iOS, macOS, tvOS and watchOS news that came out of yesterday's keynote at Apple's developer conference – if you want to get the details on Group FaceTime, Siri Shortcuts, smarter notifications, an advanced Do Not Disturb mode, shared AR, macOS dark mode and all the other new features, follow the link below. What we didn't get yesterday was any news on new Apple hardware, but code buried in the first developer beta of iOS 12 suggests that the next iPad Pro will have Face ID support and a display notch to match. The beta software also brings with it support for multiple faces on Face ID, which is another feature that would be of more use to iPad than iPhone owners. Intel isn't getting complacent with its processor manufacturing, and has just announced something of a CPU beast, scheduled to arrive before 2018 is out: the single socket processor will feature 28 cores and run at 5GHz across all transistors. In layman's terms, that means it's going to be one of the most powerful pieces of silicon we've seen yet. Asus has been showing off some stylish new hardware this week, and the Asus ZenBook S is the latest device to break cover. Featuring a distinctive hinge designed to lift the display slightly off your desk, Asus says the Ultrabook is going to be very comfortable to type on for extended periods of time, while the audio benefits from that lifted position as well. We're expecting the next phone from the rebooted BlackBerry Mobile on the 7th of June, but you don't have to wait that long to take a peek at the device. Thanks to tipster extraordinaire Evan Blass, we know how the BlackBerry Key2 is going to look from pretty much all angles, and it'll also be running Android and a Snapdragon 660 chipset.